Santorini Island Family Hotels - Pension Stella is a family business first and foremost. Offering traditional rooms & amenities, as well as its own private swimming pool, Pension Stella's motto is ' Make us your home away from home'. 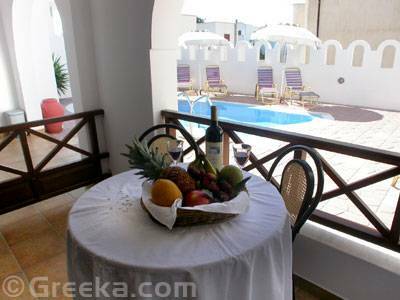 Conveniently located in the village of Karterados, which is only a short walk from the capital of Santorini, Fira, Pension Stella offers clean comfortable rooms designed for travelers who need that personal touch. Next to the hotel you can find restaurants & tavernas, cafe bars, a mini-market, bakery, rent a car & bike service, supermarket, laundry, internet cafe & anything else you might need. We provide family rooms for 2-3 persons where most rooms have a balcony. The hotel has a swimming pool with chairs and umbrellas.